They both accused one another of "stealing" aesthetics. At this point, we'd say that there is probably no love lost between Halsey and Iggy Azalea. The two are miles apart musically, but the subtle exchange of shade has been real. Aesthetics are a big deal in creative industries. We've all heard the saying "there's nothing new under the sun", but musicians and artists still like to be seen as having unique visuals on their album art and in their music videos. We're guessing that's why Halsey wasn't impressed when people started suggesting that her video for "Alone" copied Iggy Azalea's "Savior" video. 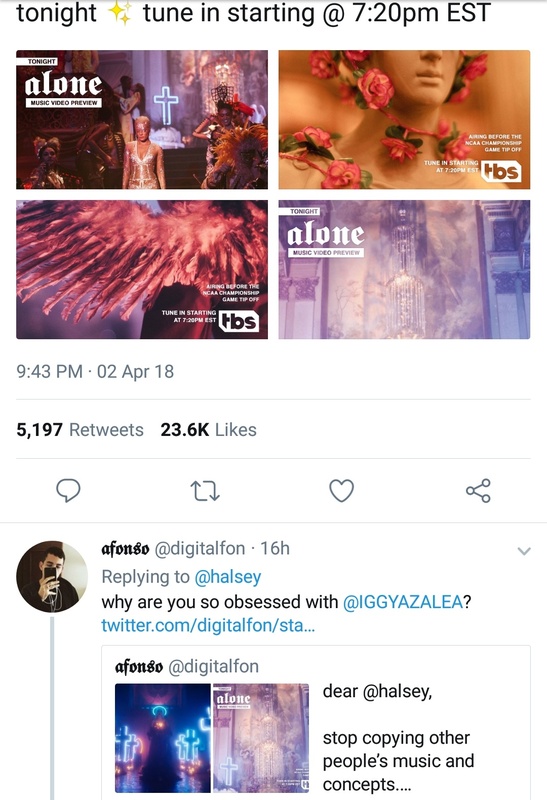 Halsey shared some visuals for her upcoming "Alone" video and people immediately started saying the aesthetics were similar to the ones from Iggy's video. In all fairness, this is basically a case of stans stirring the pot. 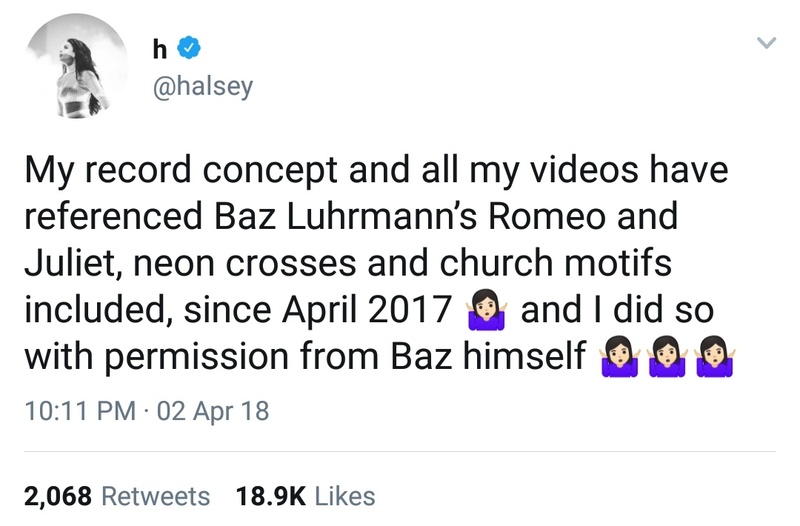 Halsey cleared up her side of the story. Explaining that she'd been using that particular aesthetic since early 2017 and that she'd obtained Baz Luhrmann's blessing to do so. According to these screenshots snagged by Pop Crave, things did get a little spicy during the debate. Iggy posted then deleted an image that read "is it crack? is that what you smoke? You smoke crack?" while Halsey hit back with an also deleted tweet that said "how can u rip off someone who ripped u off?" Neither of them invented neon or crosses so the stans are, once again, getting their faves into trouble for no real reason. We're guessing the two either sorted things out in the DMs or got a call from management because the shady tweets were soon deleted. For the record, Baz Luhrmann (Romeo + Juliet, Moulin Rouge, The Great Gatsby) has been a pioneer in filmmaking for decades and his aesthetic has inspired visual art FOR YEARS, across many genres. It's also worth pointing out that we don't typically do this to male performers. Men in music are allowed to be passionate geniuses while two women can't even be influenced by the same motifs without being accused of stealing each other's intellectual property. Either way, Halsey's video for "Alone" will drop April 6 and, unless it's shot for shot Iggy's video, we have no other choice but to declare the comparison a massive reach.